It sounds like Nintendo is ecstatic over the recent sales of Pokémon X and Y. In the first 2 days they sold 4 million copies. Not too bad. Sure, it isn't the Guinness World Record breaking juggernaut Grand Theft Auto 5 was with it's 11.2 million copies in half the time, but $4 million is still a hell of a lot of money. My Mega Power is Draining Your Wallet! Nintendo is on a roll with their time tested sales motto of "what can we re-sell next." There are even rumors of a possible remake of the Ruby and Sapphire editions getting remakes. But I can't really be disappointed until they start remaking the remakes. I mean hey, they are adding new improvements with each new pair. There's just something about this business model that bothers me. If Nintendo really made X and Y, like all the other previous dual Poké-games, to be trade-encouraging games, one would think that 50% of each version's Pokédex would only be available in one of the games for capturing, not just a select few as is the case. 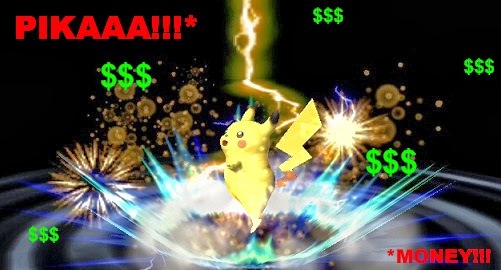 We've already seen the tried and true business strategy of metaphorically spamming Pikachu's Thunderbolt on people's wallets, and Nintendo is laughing all the way to the Poké-Bank. Seriously, think about it- they typically release two versions, and then follow that up a few years later with a combination "Enhanced Version." There's been too much gimmick and not enough growth in the series since the original almost 20 years ago. 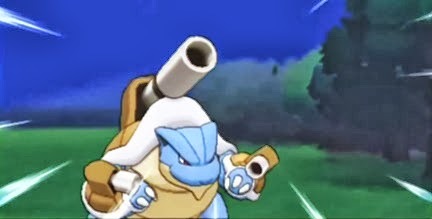 The game, like the Pokémon themselves, needs to evolve to be effective. As it is, I lost my will to "Catch 'Em All" years ago, and if I really wanted to catch any more, I could dust off one of my 50 other extremely interchangeable Pokémon games. Now that I say that I may go dig out my Game Boy Advance and LeafGreen. A previous post I wrote about Nintendo continually selling us the same product. When Nintendo wants to keep me from dating around, they can make a MMO-RPG. Until then we will only be friends with benefits.